A bishop from the “Macedonian Orthodox Church” will accompany a Bulgarian Orthodox Church delegation to Jerusalem at Easter 2019 to fetch the “Holy Fire”. This emerged at a meeting between Bulgarian Prime Minister Boiko Borissov and Bulgarian Orthodox Church Stara Zagora Metropolitan Kiprian, who heads the church’s commission on relations with the church in North Macedonia. The commission was formed after a request from the “Macedonian Orthodox Church – Ohrid Archbishopric” for the Bulgarian Orthodox Church to be its mother church. Formed in the former Yugoslavia’s Tito era, the “Macedonian Orthodox Church” is not recognised as autocephalous by the mainstream of Orthodox Christian churches. However, there have been some moves towards more cordial relations with the Bulgarian church, including participation in getting the “Holy Fire” from Jerusalem, when in 2018, for the first time, a delegation from the church in Macedonia met the Bulgarian delegation at Sofia Airport to receive the flame. 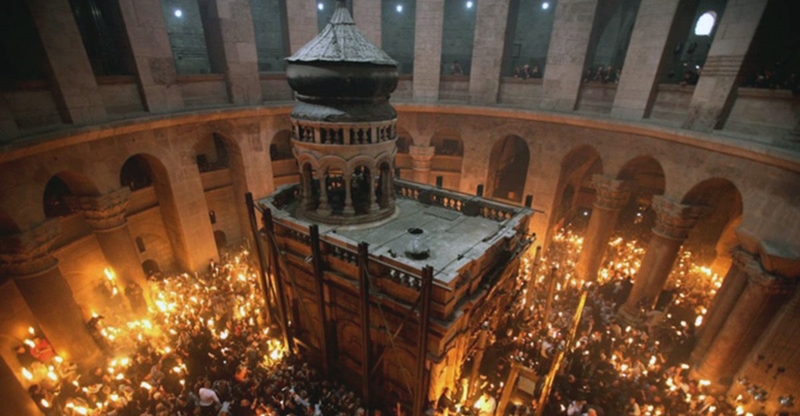 Orthodox Christians believe that the “Holy Fire” appears at Easter in the Church of the Holy Sepulchre in what they see as a Divine miracle. The phenomenon is not accepted as legitimate by the world’s Roman Catholics and Protestant Christians.